"This is a reminder that humans and creatures like this gentle pawikan can co-exist." 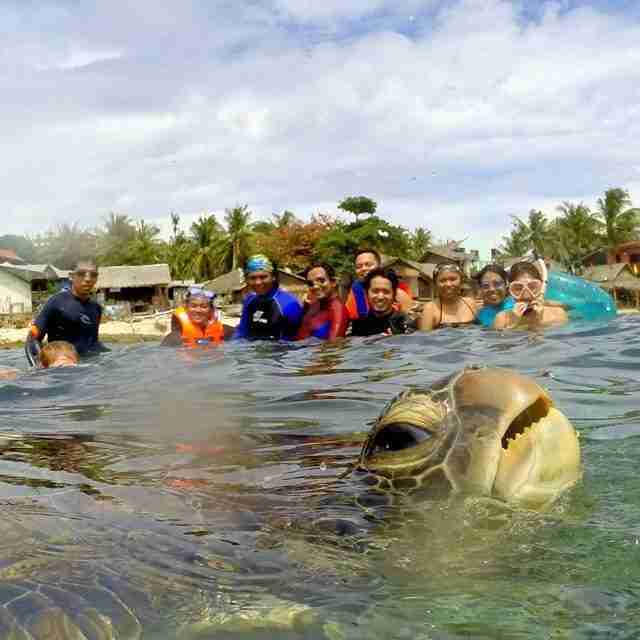 A group of friends posing for a vacation photo got a hilarious surprise when a sea turtle popped up to eye the camera suspiciously just as the pic was snapped. Diovani de Jesus caught the photobomb while he and his friends were swimming on the beaches of Apo Island in the Philippines. "We were posing for a group photo at Apo Island when this sea turtle surfaced to breathe and photo-bombed," de Jesus wrote on his blog. "Just like what my friend Genesis said, this is a reminder that humans and creatures like this gentle pawikan can co-exist." Many species of sea turtles are critically endangered - maybe this little dude was popping up to remind us humans that the ocean is his home.